One of the most popular new party board games today is Codenames, which boasts thousands of reviews and an impressive rating on Amazon. Described as a “social word game,” Codenames receives ample praise for its unique, addicting gameplay. Codenames is called “deceptively awesome” by reviewers, who love that it’s easy to learn, lots of fun, and great for groups. If you only pick up one board game for your next party, make it Codenames! Music lovers will get hours of entertainment from Spontuneous, a song-based party game that’s great for anyone age 8 and up. While there’s plenty of singing involved, you don’t need any musical talent to enjoy this game. You can play Spontuneous with anywhere from four to 10 people. During each turn, a “Trigger Word” is given, and it’s a race to sing any song that contains it, which inevitably ends in people yelling over each other. Players (or teams) advance around the board as they earn points, trying to make it to the finish line first. People really enjoy Spontuneous, saying it’s a great multigenerational game and fun to try to stump other players with tricky “Trigger Words.” Many reviewers say it’s ideal for parties and a hit among music lovers. This twist on a classic party game will keep you and your guests entertained for hours. Reverse Charades can be played by all ages, and it’s quick to set up and clean up, too! As you may have guessed, Reverse Charades is the opposite of traditional Charades. Instead of one person acting out a clue for their team, the team has to act out a word for one person. You have one minute to guess as many clues as possible, and it often turns into a hilariously hectic event. Reviewers write that Reverse Charades is an awesome party game for groups of all sizes and will lead to lots of laughter and fun. Many say that kids especially get into the game, and you’ll want to keep playing for numerous rounds. It may sound simple, but the Sequence Game is surprisingly challenging! 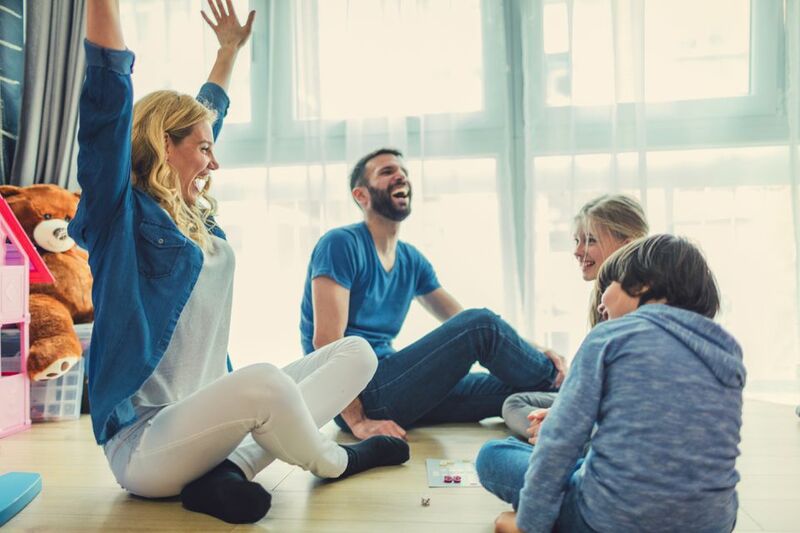 This popular board game can be played with anywhere from two to 12 people, ages 7 and up, making it a great game to bring out at your next party. The premise of the game is straightforward—play a card from your hand and place a chip on the corresponding space on the game board. The first person with five chips in a row wins. However, there are Wild Cards to keep things interesting, and a lot of strategy is needed to win, making it a fun and challenging game for groups. People call Sequence a staple for your game collection, touting that it’s easy to learn and endlessly entertaining to play. Plus, many say it’s just as fun for young children as it is for adults. While not considered a typical party game, Catan can be a lot of fun for groups, especially if you have an expansion pack that allows for more players. Things are guaranteed to get competitive as you race to conquer the island, building settlements and trading with other players. With the original game, you can play Catan with up to four people, but an expansion pack allows you to have a total of six players. In this popular, award-winning game, players collect resources and build roads, settlements, and cities around the island, racing to be the first person to get 10 Victory Points. According to reviews, Catan is a highly competitive, addicting board game that you’ll want to play again and again. It’s a perfect way to spend a few hours if you’re hosting a small party with your friends! Anyone who enjoys Scrabble will get a kick out of Bananagrams, a fast-paced word game that’s ideal for bigger groups. You can play with up to eight people, and it will provide hours of entertainment for the whole family. In this game, you win with speed—not points like in traditional Scrabble. Each player races to build a word grid with their tiles, rearranging words as needed to make them all fit. Gameplay continues with players grabbing more tiles until they’re all gone, and the first person to use up all their letters wins that round. The game goes quickly and it’s practically impossible not to play more than one round! Reviewers write that Bananagrams is a great party game for those who enjoy word games. While it can be played by anyone who can spell, things will get a lot more competitive if you’re playing with an older crowd. Sometimes the best games are the classic ones! Everyone will be excited when you bring out Trivial Pursuit Master Edition at your next party, as this popular game lets people test their knowledge in a variety of trivia categories. There are more than 3,000 new questions included in this edition to challenge your brain, and reviewers say many of the new questions have to do with modern technology and entertainment, making it accessible for teens, as well as older players. Trivia games can be a little discouraging for players who don’t know the answers, but when you play Wits & Wagers, you don’t have to get the questions right to win! This award-winning game can be played with four or more people ages 8 and up, and the Party Edition is simplified to make playing with a large group easy. In Wits & Wagers, gameplay goes like this: You read a trivia question and everyone writes down their guess. Then, you place bets on who you think got closest to the real answer—if you’re feeling confident, you can bet on yourself, or you can bet on the trivia nerds in the group. Earn points by betting strategically, even if you don’t know the answers. Reviewers love that you don’t have to be the best at trivia to excel at Wits & Wagers, and many say it’s a great party game to bring out at your next gathering. Here’s your chance to play the part of a crooked bank robber! In the fast-paced game Cash ‘N Guns, you play a group of crooks trying to divvy up the haul from your last heist, betraying each other with the use of fun props. The game can be played with four to eight people, and it’s best for players ages 10 and up. In a series of eight rounds, you’ll try to collect the most loot by surviving “gun battles.” The game comes with foam guns that you get to use to take out your opponents, hoping to be the last gangster standing. People say Cash ‘N Guns is a lot of fun for the whole family—but be sure not to take it personally, as you might be ganged up on by people you trusted!